P is my second child, and his birth story seemed like smooth sailing compared to my first child. It's amazing how you forget everything once you see your amazing, beautiful baby. 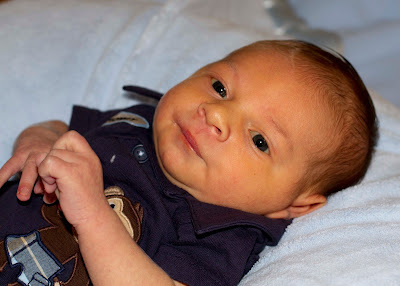 I hope you enjoy his birth story. Apparently I have a very comfortable womb. We were induced at 7:30 am on September 6, 2011. I had dilated to 2 cm on my own and effaced only about 20%. The nurse upped the dose of Pitocin every 15 minutes, and my labor was really starting to progress. Around 10:30 am Dr. Farrow broke my water. I was having good contractions and wanted an epidural, but was thinking that I was a huge wimp if I took one again. When the doctor came in again I told her I was in pain and she said I was not a wimp, and that I should take the meds if they were available. It didn't take much convincing. I had the epidural within the hour. Shortly afterward, I was able to have lunch. It was a sugar free orange popsicle. Not so yummy. It was good that I got the epidural because my contractions were getting extremely intense. Even with the epidural, the contractions felt like they did before getting the medication. At 3:15 pm I started feeling a lot of pressure and felt the need to push. The nurse checked me and said I was really close so she called the doctor. I didn't actually start pushing until 3:45 pm. They kept telling me to wait for the doctor, but I couldn't. I had this overwhelming urge to push this baby out of me. The doctor arrived within 10 minutes of P being born. In between contractions and pushing with everything in me, a nurse walks over to me and asks for my right index finger. She began to finger print me while P was crowning. I asked if I was doing something illegal, and I got a laugh out of the nurses. There was one time while I was pushing that no one was counting. I was counting in my head, but I had to hold my breath. While coming up for air, I said “Count!” and everyone laughed. The delivery nurse chuckled, "Oh yea, we are suppose to be counting for her." They were so enthralled with seeing P crown that they left me to do everything. I kept telling my husband that I had to get this baby out. After 24 minutes of pushing, tugging, and with the doctor’s assistance, P was born. Dr. Farrow pulled him from my body in between contractions. It felt like my body violently excreted him and my stomach instantly seemed empty. Kevin was able to cut the cord, and then Dr. Farrow asked if I wanted to hold him. They placed his gooey, sticky, perfect little body on my chest, and I was tearing up at the site of my son. He had a head full of dark brown hair. He cried at first and then he looked at me with his deep blue eyes. Instantly he became quiet as if knowing he was in the arms of his mother. He was 8 lbs 8 oz and 19.5 inches long. He is healthy and beautiful, and I have completely fallen in love with him. If you would like to share your birth story, please email me.